Dewey & LeBoeuf, the beleaguered New York law firm facing its apparent demise (closure? bankruptcy? a last minute save?) is having a communications crisis. 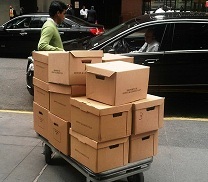 As the Wall Street Journal features photos of employees leaving the firm with stacks of boxes and informs its 2.1 million readers that some staff members will be let go next Tuesday, the Dewey website notes that Dewey & LeBoeuf Ranks #9 in Vault's "20 Best Law Firms To Work For." The webmaster at Dewey has a tough job. Partners listed on the firm’s site in the morning must be removed throughout the day as reports of departures filter in via various news media. Certainly this is a very unfortunate circumstance, imposing great pain on a team of leading legal professionals. The sight of this venerable firm’s failure is indeed painful to watch. What is the right message to be sending the market? The firm’s website seems to be reactively shrinking, instead of proactively recognizing the firm’s unfortunate plight. A syndicate of banks that lent Dewey $75 million is in continued talks with the firm and has largely gained control over the firm's expenditures, according to a person familiar with the matter. The firm and the banks have until May 15 to work out a deal.